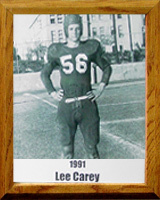 While a student at Tucson High School (1945-47), Lee was a three-sport star in basketball, football, and baseball. He was baseball and football team captains and an All-State Player (1945-46) with 32 consecutive wins in football and three state baseball championships. In basketball, his team won three state titles and Lee was All-State in 1945-46. Carey was a four-year member of Tucson’s American Legion Junior Baseball Team. In 1945, Lee was the National Batting Champion for Legion Baseball with an average of .376 — only members of the Legion’s (“Final Four”) World Series Teams are eligible to qualify for this distinction. “Stats” are computed for accomplishments in games played in the National Tournament that at that time included Regional and Sectional Tournaments in addition to the World Series. In 1947, he signed a bonus contract with the Cleveland Indians, starting in the “C” league and working his way up to Class “AAA” until his voluntary retirement in 1952. He coached baseball at Tucson High School for five years (1953-58), during which time his teams racked up three state titles; then became varsity baseball coach at Rincon High (1959-62), where his team won the state title in 1962. In 1972, based on recommendations of sports figures closely associated with Tucson area high schools, the Tucson Daily Citizen sports staff selected him as Tucson High School’s All-Time Best Athlete in the post World War II era. Lee is a member of the Southern Arizona Baseball Federation Hall of Fame.